This club owned PA1 is brand spanking new. The road foreman of engines was giving it a test run. The engine is gas powered with a hydraulic transmission. All wheels are powered and the engine has easily enough power to spin them. The SP Daylight PA1 is a Rail Systems product built for the club as gift from the Disney Family Foundation. It is being run by Jim Erickson, LALS Superintendent of Diesel Motive Power. The largest diesel that I saw there was this DD40. I didn't see it running this day but it is an impressive model. 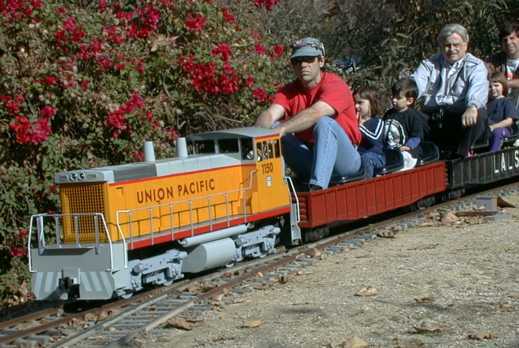 At the 1999 Fall meet, the DD40 was running and hauling visitors for the 15 minute or so ride around the park. 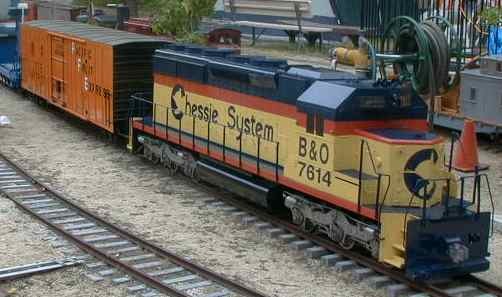 This Chessie SD-40 is battery powered and has enough capability to pull 15 passengers for hours. However, one day, it did run down on the west end and had to be hauled in with a Trainmaster. This SP Black Widow F7 was the nicest diesel that I saw there. It is entirely electric and runs silently, except for the homebrew sound system which sounded at least as good as the digital diesel sound systems that I've heard for large scale. 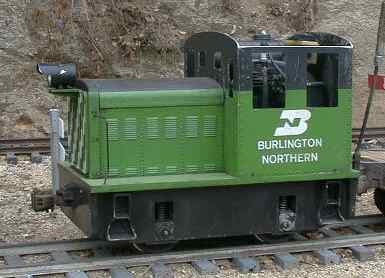 This 1" scale UP B unit was standing on a storage track. I didn't find the matching A unit. 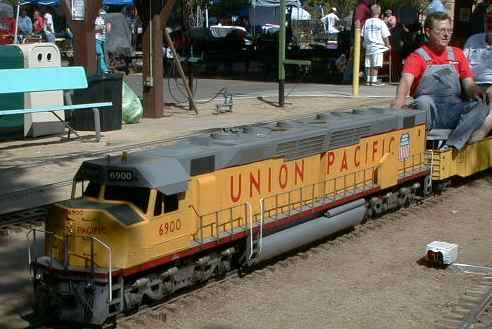 There were several 1" scale diesels there, most were battery electric. A 1 1/2" scale RS-3 was sitting in the shade. This one didn't run while I was there either. The "Smog Belt" line was well represented at LALS. This FA was running well. This gas powered SW1200 (I think) was running back and forth most of the morning, doing the switching work for which it was designed. 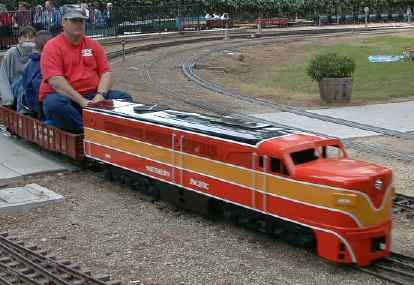 There was a model of EMD's GP-9 demonstrator on a storage track. 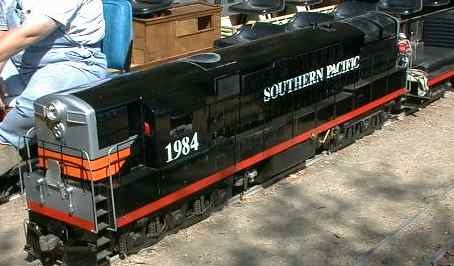 This little industrial switchers is powered by a one lung gas engine. 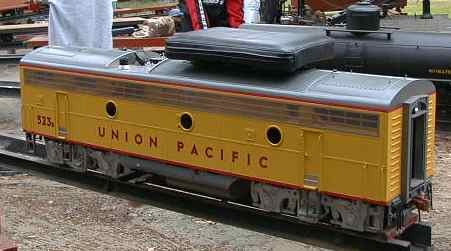 This is a gas engine powered model of a Fairbanks Morse Trainmaster. In its day, it was the most powerful Diesel in existence. Two RS-3's and a SW class engine are parked in the yard in this photo. Each of these engines is gas powered with a hydraulic drive. 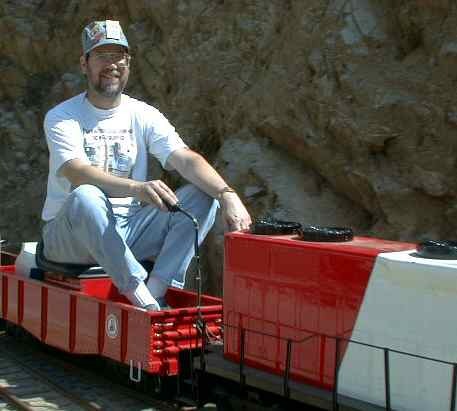 Since the time that this page was originally created and the Fall Meet (Oct 2-3, 1999), your's truly has joined the LALS and qualified as conductor and engineer on the Diesel equipment. 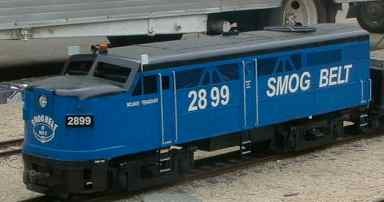 I don't own any of my own equipment, but this day I was hauling the public with one of the club owned SD-40's. This UP switcher is virtually brand new on Dec 31, 2000. The owner is hauling the public on a sunny Sunday afternoon.